The costumes for Irish dance performances are frequently attractive, colorful and lively affairs. Often, the costumes are fantastic interpretations of traditional Irish regional wear. 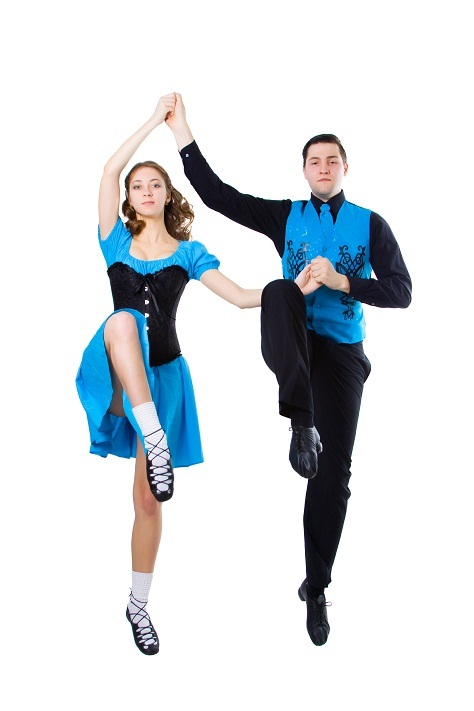 Irish dance costumes must abide by specific regulations for competitive dance purposes. The costumes are distinctive for males and females. Men dancers generally wear kilts and jackets which have evolved in more recent times to a pair of black trousers teamed with a colorful shirt and tie. Women dancers wear pleated skirts that are stiffened to accentuate their foot movements. Irish dance costumes may also take on the varying hues of dance schools and follow the colors and design of the particular school. When competing at regional, national and international levels, Irish dance costumes are more ornate, often utilizing elaborately embroidered velvet. Costumes made from wool were also popular. As the popularity of Irish dance soared, competitive costumes became more intricate. A wide array of fabric was employed in the tailoring of dance costumes, including organza, lace, silk and sequins. The skirts are always stiffened due to the nature of the dance, which does not lend itself to swirling swathes of cloth. The pleats on the skirt are further stiffened using Vilene. At most championships, the stylish Irish dance costumes for women dancers can weigh several pounds. Solo costumes worn at Preliminary and Open level championships enable dancers to display their unique sense of style. Costumes convey the dancer’s personality and aid in singling out the dancer from the crowd. The solo dance costume may be tailor made for a dancer with their choice of fabric, color and design. Irish dance costumes are hand made and very expensive. Some dancers are known to hire costumes or buy second hand material from other dancers instead of having them tailored. Costumes for championships make use of generous amounts of costly fabric and sequins and are made to measure. No two costumes will be alike. Irish dance costumes for folk dance performances replicate traditional Irish mode of dress in fanciful designs. Costumes worn for championships must follow certain competition rules. Skirts are stiffened pleats that allow for a precise demonstration of the dancer’s footwork. Solo competitive dancers have a greater lee way in style and design.